Please note: this site serves historical purposes only and bears no reflection of the band's current activities. Spaceritual.net and Tractor live at Hebden Brdge Trades Club, 1/2003 & The Picture House, Hebden Bridge, West Yorkshire, 10/2002 - Review and Photos here! 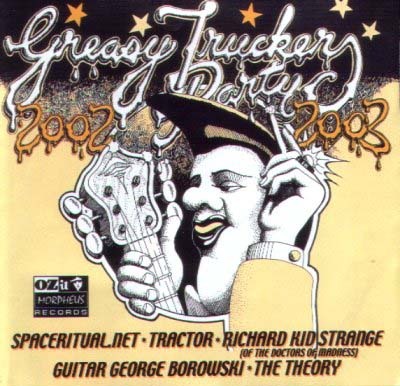 Goldmine's Jo-Ann Greene reviews Greasy Truckers Party 2003 in her regular A Broad Abroad column! Browse new live photos of Spaceritual.net by Mark Flowers - click here! Legendary SpaceRitual.net and ex-1970s Hawkwind member Del Dettmar of the In Search of Space line-up of Hawkwind will be joining SpaceRitual.net's UK tour within the early days of the tour! He should hopefully be with the band by the Southampton date when he arrives over from Canada to do signal generators and noises for the tour. Plus Tractor - 1970s original line-up - launching the 30th Anniversary issue of the classic Dandelion Records' Tractor album: Jim Milne - guitar and vocals and Steve Clayton - congas and drums/percussion. Nik's words: "This is the first time I've been back in Exeter since the court case", said clearly with a wry grin on his face, as it would seem that Space Ritual were obviously having a good gig. And it was! For over an hour and a half, the audience was treated to some great renditions of such classics as Ghost Dance, Born to Go, Brainstorm, D-Rider, Master of the Universe, Orgone Accumulator, Shouldn't Do That, Children of the Sun and Silver Machine, linked by synthy swirls and poetry pieces (the Black Corridor being one of them), and also the fab Inner City Unit song, Watching the Grass Grow. A great treat was the new songs, one by Michael Moorcock called Sonic Savages and another written about Timothy Leary when Nik visited him in a mental institution. Both these new works were instantly memorable and are promised on the new forthcoming studio album. At one point, there were nine musicians on stage, and you really had the feeling that this could have been the Roundhouse in 1971, complete with oil wheels and bubble machine. Coming from the right place, and if you can get to see them, then do! A great band on form and having fun. What it's about really. The Line up: Nik Turner - sax, flute, vocals; Terry & Sam Ollis (Terry's son) - drums; Mick Slattery - guitar; Dave Anderson - bass; John the Ghost - keyboards; Del Dettmar - synth-axe; Alice - percussion and vocals; Thomas Hewitt - guest guitar. Saw you at The Brook and was priviledged to meet all of the band backstage. That gig has to be the best I have ever seen or heard, you and the band have captured the essence of what Hawkwind were, are and should be. Spaceritual.net is the perfect name for the band. What a pleasure it was to see 11-12 muscians/singers/people on stage enjoying every minute of what they are doing as much as we, the audience, were! Your choice of songs was beyond belief, even now I am still on a high, so you must return to Southampton before I come down off the high; my 2 oldest kids want to come and see you all and enjoy the experience. Well must leave now in search of space for magnu. All the very best & hear from you soon, I hope. Saw you and the group at Brighton and I have to say was impressed. 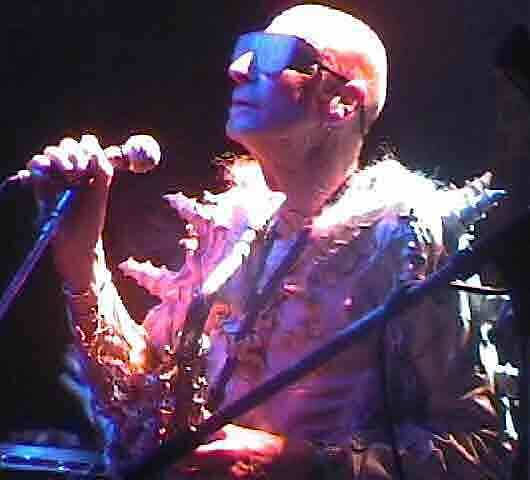 I have been into the Hawks since the Hawklords days and thoroughly enjoyed the evening, the crowd you pulled were a very easy-going and genuine bunch, a lot less hassle than some of the lairey lot you come across, the aggressive ego-pumping buggers normally in the smoke. Well worth the drive from Folkestone & stop-over. Some of the music was very trippy and I thought the Masters... was the best I have heard in 20 years! Objective evidence - I was enjoying myself! Always thought you were the pick of the bunch - keep doing it, a lot of people are surprised! On Sunday, I set off with my brother to Brighton to see how things go with Spaceritual.net. I had seen them before but my brother has not. He is not a Hawkwind fan as such but does like their music and would go and see them live within reasonable distance. He did go and see Hawkwind end of last year at the same venue. His verdict after the gig was: Spaceritual were better! He thought Hawkwind were really good last year, better than the 2001 Brighton gig but this was better! More authentic. He is not on the internet so has never read nor has any interest in which group has the claim to the name, etc. but he did feel it was closer to early Hawkwind than Hawkwind themselves. In many ways I agree with this. Every song Nik's lot did was long and the solos rambled slightly. The big advantage now is that they actually know how to play the songs! If you like short and to-the-point songs then this is not for you. I personally love Hawkwind and the stuff they do but do love the rambling solos like Nik's lot do. Del Dettmar was on stage but I couldn't hear him. Could he hear himself? I do wonder as I was standing at his side of the stage. Very audible was the keyboard player John Green. As usual, Nik came along through the crowd. The crowd wasn't as big as at the Hawkwind concert but I was at the front so I could be wrong. After the long intro of Nik's coming through, they went into Born To Go. This was followed by Watching The Grass Grow and then Sonic Savages. The latter was really good and wouldn't sound out of place on an Inner City Unit album. Then they did D-Rider and an instrumental from Del/John. All of this took about 45 minutes, and that was followed by Ghost Dance. I also liked the song about the Mental Hospital thingy. Other highlights included Children Of The Sun and Brainstorm. They even did Blue Train which I like. Sadly, no You Shouldn't Do That and not much spoken word. 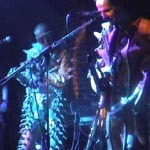 Songs done by Hawkwind last year also done by Spaceritual.net were: Master Of The Universe, Ejection and Silver Machine. People have been complaining that they have too many people on stage but I disagree with this. I think the two drummers are perfect. Whilst Sam didn't play on every song, he did play on most of them. The double drumming could really be heard in places and it did sound very fusion/space-rock-like. Then, at times, when Sam wasn't playing, you had the bongo player and it still sounded like two drummers! about this previously but have been converted fully to the fact that he is good. Any one care to disagree? Nik didn't play the flute too much and when he did they didn't always bring him up loud enough in time. He allowed room for the other musicians rather than playing over them. Del couldn't be heard so I just had to accept the fact that I can see him doing stuff but not hear it. If I hadn't thought like that I would not have enjoyed the concert. I had hoped it would only be Del at the gig so I could just hear the sounds he makes. He played his axe and kept moving pegs on what must have been his EMSA synth. He also turned a few deals on that and some other equipment now and again. There was a certain amount of electronic stuff between songs but they still had some gaps and the songs ended rather than fading out into a mess. That is something both bands miss that early Hawkwind had. Thomas Hewitt played guitar every so often, and they had the two dancers. They managed to fit everyone on stage which was great, and I went home very very happy. The support act, The Theory, were okay in places. Some songs were good and others great only in places. The rest were not good. More work required. So, all in all, very happy. Concert ended at around 11: 30/40 pm after at least 2 hours. Something like 2 hours 10 minutes. Just have to say what a brilliant gig last night. It was done in the true sprit of what Dave should be doing now, Nik and his guys played for the audience. And as for being played out at the end by the theme from the Pink Panther, well what can you say... just pure entertainment from start to finish! The last time I saw Hawkwind was at the Leascliffall, Folkestone, some years ago (I only recognised Dave Brock) and the show was pretty dismal. I was talked into going to the Spaceritual gig at Brighton and I'm glad I went. Machine, Children Of The Sun as well as some Calvert material (Ejection) and other songs that I didn't recognise. The light show also captured the moment to perfection. The dancers were great and for a minute I thought I was looking at Stacia (remember her?) but the other two (Alice and the conga player seemed a bit superfluous). Was Del Dettmar there for show or was he really playing? When he stopped to smoke (I assume) a joint, the electronics and synths continued regardless. Nik Turner fronted the band in his old inimitable style and, all in all, the show was a total mind-blowing experience I haven't seen since the '70s! I recommend any fans of the early Hawkwind to see them, it was a totally deja-vu-like recreation of Hawkwind at their best. Keep it up, guys. Really enjoyed the concert. Thought it was absolutely brilliant. Please don't let the disappointingly small crowd put you off coming back to Northampton. I'm really looking forward to seeing the band again. "...really enjoyed it, thanks. You could probably tell everyone had a good time, it was a great atmosphere. My friend described it as a 'life affirming experience', so, uh, there you go. It was great that Del could be there, and I hope 'Miss Debbie' becomes a permanent feature!" - Andy R.
"...priviledged to meet all the band back stage... gig has to be the best I have ever seen or heard, you and the band have captured the essence of what Hawkwind were, are and should be. What a pleasure it was to see 11/12 muscians/singers/people on stage enjoying every minute of what they doing as much as we the audience were. 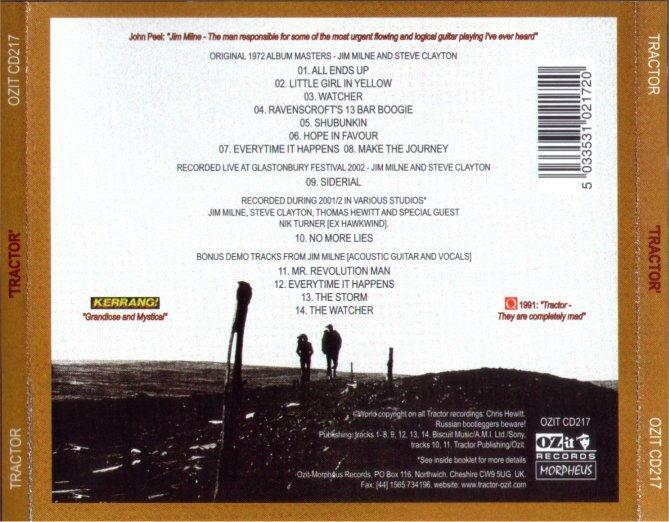 This new 30th Anniversary Edition of the Tractor "Tractor" CD (Ozit CD 217) contains 6 bonus tracks, including a brand new track featuring Nik Turner on sax and flute, as well as a track ("Siderial") recorded live at Glastonbury Festival, 2002. Available from Ozit/Morpheus Records on-line! "Spaceritual.net treated us all to slabs of cosmic rock in the late afternoon served up with a suitable side salad of bizarre costumes, dancers and weirdness. Hawkwind faves Brainstorm and Orgone Accumulator were the highlight of a set that was powerful..."
"Spaceritual.net - a motley collection of former Hawkwind members plus bongo players and idiot dancers (including a brickie wearing a negligee and DM's - Alice Rhubarb) momentarily enticed the sunshine with Brainstorm, Masters Of The Universe and Orgone Accumulator…"
"Although Fish headlined on Friday with a jovial performance, Spaceritual.net was one of the most entertaining acts. All 12 members, including quite a few ex-members of Hawkwind, played a baffling set that was more Space Oddity than Spaceritual. They were certainly one of the more colourful acts on the show." Michael Moorcock joins Spaceritual.net as a member and collaborator! 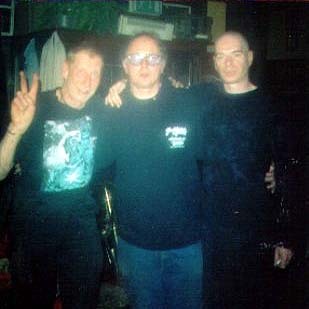 On 16th July, Michael Moorcock has confirmed to Nik Turner that he is joining Spaceritual.net. The band are really looking forward to working with Michael on future releases and some live appearances later on this year and beyond. 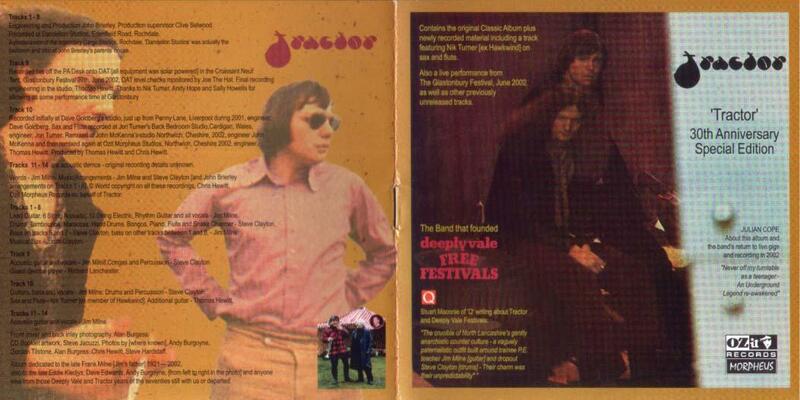 Read Mick Slattery's own account of the legendary Group X gig at All Saints Church in 1969! spaceritual.net has been put together by Nik Turner, and features several members of the original Hawkwind line-up. Core members of the group are Nik Turner (sax, flute, vox), Mick Slattery (guitar), Thomas Crimble (rhythm guitar), Dave Anderson (bass), and Terry Ollis (drums).